Happy Saturday everyone! Today I have a fun and easy project for you which looks SO cute (or elegant, or cheery, or whimsical - whatever you choose) and gives you a fun place to set your drink on. I'm always looking for fun things to stamp on that will look nice in my craft space and th ese little coasters do the trick. I picked up this set of 4 acrylic photo coasters at Michael's (don't forget your 40% coupon!) and what I love about them is there is enough room between the acrylic plate and the base of the photo holder to give me some dimension to work with. I'm thinking buttons, and ribbon, and rhinestones - oh my! I'm making coasters for summer, so Fresh Flowers is the perfect set along with the Mother's Day Key Ingredients kit. Some other ideas for your personalized coasters are themes for birthday parties, holidays, all seasons, or whatever your mood is for the week, *wink*. These particular coasters hold photos 2-5/8" square, so I trimmed my cardstock to that size and added the circle scallop Nestabilities die to each square. After stamping the images in Memento Rich Cocoa on Choice Buttercream and coloring them, I used the circle Nestabilities die and layered it over the scallop. 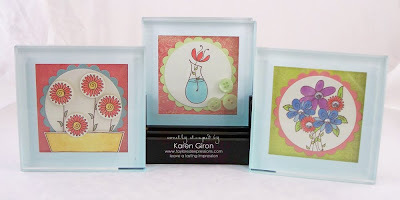 This is a fairly simple project and you can make it easier by simply stamping directly on one layer or more difficult by adding more layers and embellishments. Be sure to hop on over to the Taylored Expressions store and sign up for the newsletter. You will have more fun projects and Taylored Expressions updates delivered right to your inbox! Sign up on the homepage sidebar. this is great, Karen! I love coasters as gifts-TFS! Oh my WORD! I have a set of those coasters in my closet! I can so tell you what I'm going to be doing next week!!! Not only is this a fabulous idea, but these are absolutely charming!! Love your coaster set!! Wow, this is wonderful! What a great gift idea! These are adorable, Karen! Love them! Karen!!!! You are a Super STAR!!!! Oooohhhhh....ahhhhhhhhh....LOVE the coaster idea!! I stamped on tiles from Lowe's for Christams gifts last year, however, these look much more inviting! This is awesome!! what department at Michaels? ?don't remember ever seeing those at any of the Michaels here. These are so whimsical and summery! Makes me just want to grab a drink and use one! Super cute idea....might just have to make a couple sets for teacher gifts! Super cute! Thanks for the inspiration! Karen, your coasters turned out beautifully! 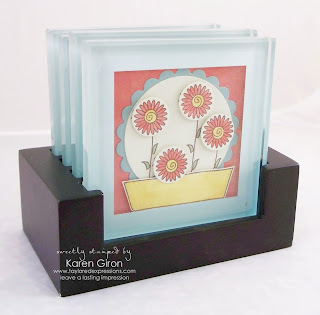 I love that you can add dimension under the glass like that....awesome! I'm going to have to pick some of those up very soon! These are GORGEOUS girl! I totally want to make a set of these now! Fab idea and gorgeous result!! Oh wow! I love that there's room for some *thicker* embellishing! I'm going to have to go look for these! Beautifully done, Karen! This project is totally "cool"! Yep, icy cooooool! You have such fantastic ideas!!! Thanks so much for sharing!